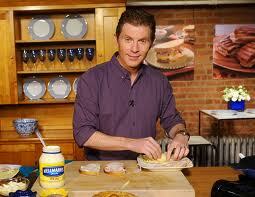 I would love the opportunity to get to interview Chef Bobby Flay for my Nutrition Column at OC Mom's. I have read some of his books and have always found his cooking style very unique and different. I love a good sandwich, however I feel that is is SO important the parents learn how to make healthy sandwiches for their children. Making healthy sandwiches is easy to do. It is a great opportunity to add a lot of vegetables into your child's diet. You can substitute lettuce with spinach, add tomatoes and even add green beans to give their sandwich a little crunch. Use sandwich making as an opportunity to add lots of extra veggies into your child's diet. They want to know how you slice it, spread it, stack it or serve it ... Do you spread your Hellmann's® Mayonnaise on one slice or both? Is the cheese on the top or in the center of the sandwich? All you have to do is go to Facebook.com/hellmanns to share your sandwich-making tips, tricks, techniques and secrets. You'll also have the opportunity to build your perfect sandwich and enter the Hellmann's® Build Your Perfect Sandwich Sweepstakes for a chance to win great prizes including a kitchen essentials bundle, grocery gift cards and Hellmann's® and Best Foods® products. Did you know that 33 percent of Americans who eat sandwiches credit their mom with teaching them how to make a great sandwich? And nearly three-quarters (71 percent) of moms with sandwich-loving kids say they serve their families the favorites they ate growing up! Wow! That is so neat!